Listen to this track by progressive rock artistes and concept-album toting quintet The Moody Blues. 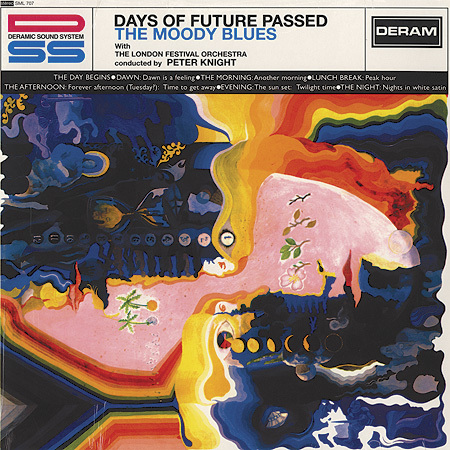 It’s “Tuesday Afternoon”, a track awash in mellotron and orchestral flourishes, and a highlight as taken from their 1967 concept record Days of Future Passed, and released in single form the following year. Also known as “Forever Afternoon (Tuesday? )” as a part of the album, this song helped to carry the group, and a certain strain of rock music, into the 1970s. The song was released as a single in 1968, under the title “Tuesday Afternoon” and re-cut as a stand-alone track, written as it was by relative newcomer to the band Justin Hayward who wrote the song on an actual Tuesday afternoon, playing outside with his acoustic guitar – in a field no less. The album version leads into fellow Moody songwriter Graeme Edge’s “Evening”. Both tracks contributed to the concept of the album; tracing the course of a day, which started with “The Day Begins”. Eventually, the record concludes with the final track, which you might have heard of – “Nights in White Satin”, yet another single written by Hayward. The song itself is a great example of proto-prog, broken up into sections marked by different tempos, and with a pseudo-spiritual feel to it, lyrically. The sumptuousness of the arrangement which includes something of a cinematic orchestral section also adds to the idea that the group was looking to expand their scope, if not the scope of what rock music would become by the end of the ’60s. And regardless of how you feel about concept albums and orchestras playing on them, the great part about this song is that it’s pretty self-contained as a single, even if it’s on the album as a part of a section. The song remains to be a concert favourite for the band, who continue to tour today. This movement toward orchestras and conceptual approaches to making records is sand in the vaseline to many a rock music fan, of course. And there is a fine line to be struck when it comes to this sort of thing, with the concept always in danger of eclipsing the actual songwriting. But pushing past the conventions of the progressive rock form for a second, this song is certainly tuneful as well as being emotionally evocative. It may well be about a sense of lofty spiritual wonder, with trees calling and having to find out why, and all that. But, maybe it’s also about how to see the details in our lives more clearly, certainly a theme that transcends all genres and brings things down to earth. It reminds me of how moments are important, that Tuesday afternoons, just as a for-instance, are often rooted in the malaise of a working week, a time when crystalline moments of beauty or profundity are buried under the weight of mundane routine. So, maybe this song is less about gentle voices explaining all with a sigh, and more about keeping one’s eyes open for meaning or beauty as we’re making our way through life, day-to-day. In this respect, a Tuesday afternoon becomes something other than just a stretch of time. It represents a potential turning point where all moments are recognized and treasured in a life where the days are passing whether we celebrate them or not. For more information, check out The official Moody Blues website. This is a guilty pleasure, right, Rob? Right!? Rob? I love me some Mellotron, Geoff. Occurred to me last night while listening to some Mellotron stuff, in case somebody reading this is interested in Mellotron stuff, although the instrument has been replaced with smaller, less-fragile, cheaper digital devices, some bands today still use the Mellotron. Porcupine Tree. Just throwing it out there. Great tune. And definitely not a ‘guilty’ pleasure! Loved your review. This music predates the current trend of cynicism, irony, and the tiny, poorly lit cell of “hipness”. At least the gratingly nihilistic neo-hip version. I think you’re last sentence is spot on!